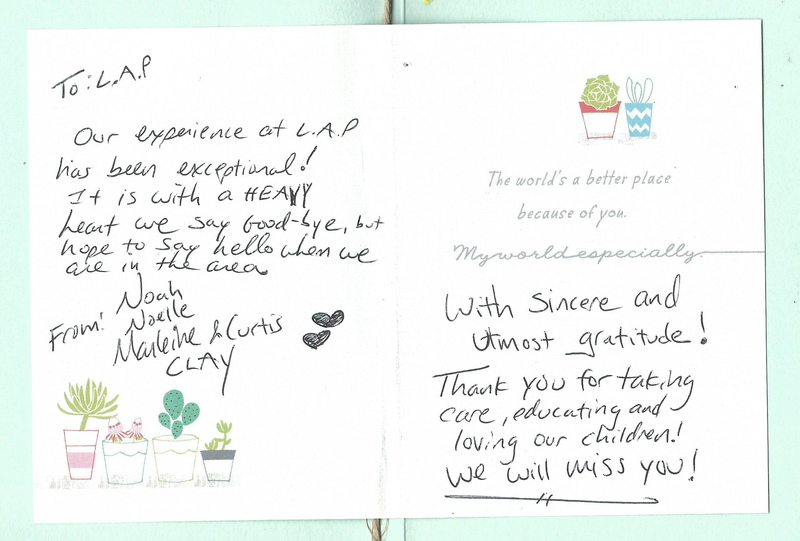 Our experience at LAP has been exceptional! I am very sorry to say this, but this a written notice withdrawing Daryn Dickens from Little Acorn Patch. We have had such a wonderful experience here for both of my children. I regretfully withdraw her from the Nile River class. I am working as a teacher at a private Christian academy and they have allowed her to be admitted. Her tuition will be offset by my employment. I hope you understand and I appreciate your great staff, including, but not limited to Ms. Trish, Ms. Maneeka, Ms. Kristen, Ms. Susa, Ms. Kim and Carmela. 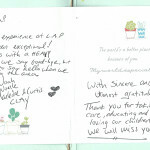 Please allow me to compliment your staff and wonderful program here at Little Acorn Patch. Our Daughter, Marisa Surtees, has been enrolled since last September and enjoyed every minute! However, we need to move Marisa to another school effective March 3, 2008. We really have had a wonderful experience at Little Acorn Patch. In particular, Ms. Kristen, Ms. Julia, and Ms. Ana Lucia in the Wobblers classroom are fantastic. During the last six months our daughter has learned a tremendous amount about sharing, verbalizing, and playing with other children. You have an awesome team in place for the 18 month old program and we are going to miss them all very much. Please feel free to give me a call to discuss further, or for any letters of recommendation or parent testimonials. We will definitely be recommending Little Acorn Patch to other parents in the area! As working parents, it is hard to find a place where you can provide a comfortable and secure environment for your child; however, we have found that place with The Little Acorn Patch. What I love the most about The Little Acorn Patch, and I am yet to find it anywhere else, is the blend of a learning environment (circle time, letter of the week, arts & crafts, exercise, singing and dancing), with a loving home environment (homemade lunch, consistency of staff). Yesterday, we had the pleasure of sitting down with Ms. Kristin for our first Parent/Teacher Conference regarding our son Emerson. A consistent concern that Brian and I have had with Emerson has been his speech and manners. While we are still actively working on both, we have noticed a dramatic difference in Emerson’s manners with his first two months at The Little Acorn Patch. For example, Emerson is now more respectful with books, using his utensils more, following directions and helping to clean-up. I have also arrived at the center to find Emerson quietly sitting up front by Ms. Kristin, while she is reading a story to the class. We understand first hand how much energy our son has and wanted to express how fortunate we feel to have teachers like Ms. Kristin, Ms. Mandy and Ms. Julia teaching him. The love and patience that Ms. Kristin, Ms. Mandy & Ms. Julia have put into our son, Emerson, makes us realize how lucky we are to have found a place we can call our home away from home. Thank you for the amazing and enriched environment you provide everyday for young students to learn and thrive. I appreciate the love you pour into this space where every child is known by name. I cannot thank you enough for teaching, caring for and loving my daughter. Being a working mom is hard. Finding good childcare is even harder. Finding outstanding childcare that matches what you value is extremely hard to find. My family is so blessed that we discovered you! As an educator myself, I was seeking a specific environment. I wanted a place where children are encouraged to be children and where learning is engaging and fun. I wanted a family environment where a child could feel a sense of belonging without being lost; one among too many. But at the same time, I needed an academic environment. My four year old would have one year of preschool before kindergarten so finding a “school” was important. But as a working mom that needs all day care, how do you find the right balance with school and care? I almost gave up. I reviewed ten schools in the area and I stumbled upon Little Acorn Patch. WOW! I couldn’t believe this gem was right in my own backyard. Everything I could ask for educationally all in one location: extended care options, enrichment, specific curriculum, amazing educational resources, Multiple Intelligence educational philosophy, friendly, excellent communication with parents, engaging outdoor play space, and healthy meals and snacks. I am most impressed with the well roundedness of the Little Acorn Patch program. The teachers are highly trained something that is very difficult to find. I did not find any other program that included teachers with educational and other degrees. In addition, the enrichment options are equally impressive. My daughter loved Language Stars, Funtastics, Miss Lea’s Music, Mad Science and all the special programs. I am also thankful for your flexibility. Thankful that you provide part-time options for parents who work part-time. I am thankful for the flexibility to have extra days. This was especially important during the year when a family member faced hospitalization and when my own work schedule was adjusted. It is most impressive to see educational best practices being implemented everyday! Students are actively engaged in learning in small group instruction with the teacher as the facilitator. The learning activities are learner centered and kinesthetic. The environment is an immersion of language based experiences to build background knowledge and promote literacy. Stu­ dents are always sorting, counting and classifying. The Everyday Math curriculum is outstanding. The art and creativity is impressive as well. The students were even introduced to writing workshop and guided reading. The weekly themes effectively build background knowledge and keep kids excited and engaged. The whole program is balanced and age appropriate: time for playing, listening, reading, creating, problem-solving, exploring, painting, writing, counting, learning, questioning, sharing…ALL so important in early childhood! I wanted a program that taught the whole child! I found a program that exceeded my expectations. I am thrilled that my daughter was able to learn and grow this year at the “nut school” (my daughter’s nickname for the school). We are sad to leave but you did your job and she is ready for kindergarten! If she wasn’t ready, I know your kindergarten program is out­ standing and we would absolutely continue at Little Acorn Patch. I cannot thank you enough and I will continue to recommend the Little Acorn Patch for years to come. Thank you for creating such an amazing school and for all the ways you partnered with us to help our daughter grow and excel. It saddens us to let you know that CJ.’s (Christopher Clarke Jr.) last day at Little Acorn Patch will be on Friday, August 22, 2014. We would like to thank you for all you and your staff has done for all of us through the 4+ years he has been here. We tell everyone how wonderful your preschool is and how much we love it. I have to say we are tough critics and you continually go above and beyond in all standards in learning. We loved the mad science, the language, and the funfitastics …all the extras that were not extra meant the world! Ms. Chau is wonderful! She is a great help to us in the morning and C.J. loves to sit with her and have breakfast, most days he wants to eat with Ms. Chau and if he is hungry before he wants a snack but only if he can eat it at school. C.J. would come home on many occasions and say, we learned this in mad science, or we would hear him singing a song in his bed when he is waking up, and all the teachers\kids saying hello C.J. and when we leave everyone has to get a hug or a hi-five. He truly loves Ms. Sarah and calls me (mom) Ms. Sarah all the time. What a great way to end out our last year than with the Kindergarten program! It was wonderful and a great prep for next year! He has made several friends that I am sure will remain lifelong friends, all thanks to Little Acorn Patch! You will be greatly missed by The Clarkes! I am writing this letter to thank you for the head start and enrichment my daughters received while attending the Little Acorn Patch in Alexandria. My oldest daughter Abby, is in Kindergarten and I continue to be impressed with how prepared she was upon entering her new school when we moved. Her teachers remarked at how far ahead she was, and she is currently reading on an advanced first grade level. Her knowledge of other countries and their cultures is a direct result of Ms. Carmen “visiting” a country each Thursday. She can tell time, and loves Math and Science. My second daughter Riley who just turned 4, called her new teacher Ms. Trish for the first two weeks, and told her new teacher it was because she missed Ms. Trish so much! She is also ahead in her class, and was recommended to enter their second level of Pre-K earlier than anyone in her class. She counts in the hundreds, writes her name, and other words, and of course knows all her letters, shapes, and colors. Not only were we impressed with how well our daughters were prepared, but we also loved the individual attention, care and love they received at Little Acorn Patch. They talk about their teachers and friends they had, and still miss to this day! Thank You Little Acorn Patch Staff for a wonderful and valuable start to my daughter’s journey in education. You have provided a strong platform, upon which they will continue to add onto in the future. Parent Carol McQuillan, M. Ed. We have been Patch parents since 2010 and it’s been an excellent experience the whole way through. And now the time has come for Claire to enter Kindergarten. This is our written notice withdrawing our daughter, Claire Bowman, from the Little Acorn Patch in Springfield. Her last day will be Thursday, August 21, 2014. Thanks to the wonderful work of the Little Acorn Patch staff, we are confident that Claire is not only ready for Kindergarten but will excel. We have a few more years left as Patch parents with Henry and look forward to watching him grow and learn the same.